Ever since we started live Facebook videos, we have increased our traffic in our office. 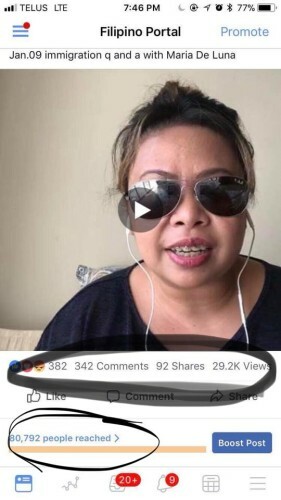 Within 10 hours from posting this, this video was shared 40 times with over 9.8 thousand views with over 41 thousand people reached. That’s awesome numbers in my books. We thank Filipino Portal in Canada for these screenshots. 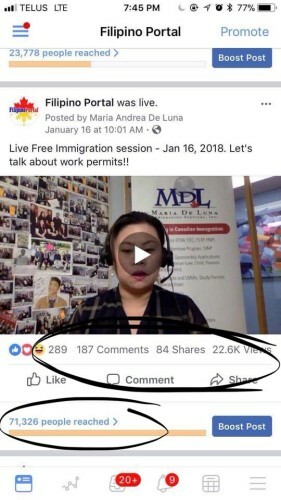 Maria De Luna also provides Free Immigration Live Q & A through their Facebook Page every Tuesday at 10:AM CST.